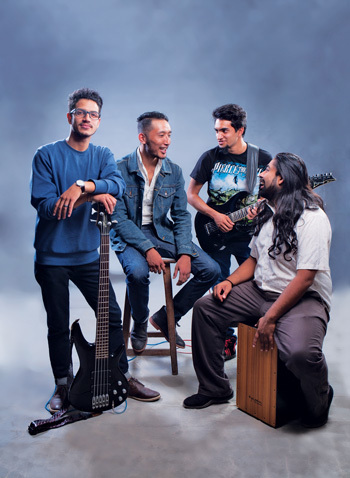 One among the many bands emerging and planning to go all the way to make a mark in the music industry in Nepal is Yatra, an alternative rock band that dreams of someday changing the view and thinking of people through their music. This four-man band makes their own music nowadays. “Afai Thik Huncha” is one of their originals, among others, from an EP album that’s going to be available to their audience next year. The acoustic pop song is a soothing combination of soulful plucking and strumming, with vocals that give meaning to the lyrics, providing a dreamy vision of what the song is trying to portray. Well, who doesn’t like to get lost in the song, imagining and linking their own life with the words and music of a soulful song like this? Although only two of the band members, the vocalist and the guitarist, can be seen in the video of the song made by songsnepal for an acoustic song competition, the whole band had put in their efforts, explains both the members. When asked about the EP and the kind of songs in it, the band members hinted about one of songs being a love song, while the others are going to be full band rock songs, giving the audience an insight of different aspects of life. Jamming and rehearsing in Music Circle,one of the most popular hangouts for musicians, also provided them an opportunity to get ideas and input from musicians who regularly hang out there. Among the many bands emerging, the music Yatra is making sounds promising enough to make a mark in Nepali music industry. It’s quite a hard work being a musician, especially in the country like ours where Music industry isn’t commercialized to the point that can support a musician’s livelihood and one can make a career out of it. Located at Bakhundole, Pulchowk, Lalitpur, Music Circle is an independent learning centre started by well renowned musician Kiran Shahi and his students Chhitij KC and Sajan Maharjan at the end of April 2015. The Circle, initiated as a centre of learning for playing drums, gradually expanded to become a centre of learning for all types of music. Its aim is to provide quality music education to anyone interested in learning. Being a community-based learning platform, rather than an institute, musicians here help each other grow to become better musicians. It can also be seen as a hub for musicians, a junction where musicians from all over the place meet up. Marcus Dengate, professional international musician and a teacher,along with other professional Nepali musicians, share their knowledge with their pupils here at economical fees. Offering different level courses for different stringed, keyed, and skinned instruments, the Circle also provides their students with flexible timing according to the respective teacher’s involvements. For further ease of students, guidance to selecting proper instrument is also provided, making Music Circle a one-of-its-kind music school in the valley.